I was walking the dogs through High Park when I saw this beautiful red cardinal sitting at a fountain, but by the time I could get my camera out and ready to shoot, the dogs’ barking scared it away. Too bad! So I sat at a nearby bench and took photos of this robin hoping that the cardinal would eventually come back, but I had no such luck… Maybe next time! 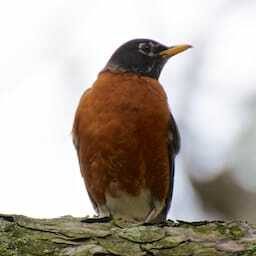 Robin at High Park was published on Thursday, September 13, 2012 at 1:00pm EDT by Daniel Menjívar and last updated on April 11, 2018 at 9:30pm UTC .